This post contains affiliate links, the opinions on the products are 100% my own. I’m a coffee lover, so is my husband. We have always bought good coffee and drank quite a bit. For the last almost 2 years I have limited my coffee drinking because I was either pregnant or nursing. My husband is cutting back on his coffee intake too. In this new era of just a cup or two a day we need those cups to be amazing. Enter our favorite Christmas gift, a Keurig 2.0. 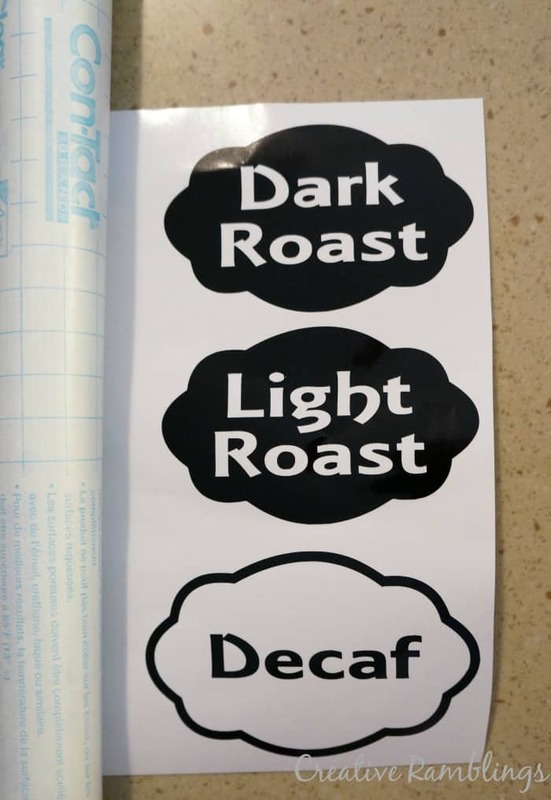 I love that I can have a full-bodied cup in the morning and a cup of flavored decaf in the afternoon, without making a full pot. 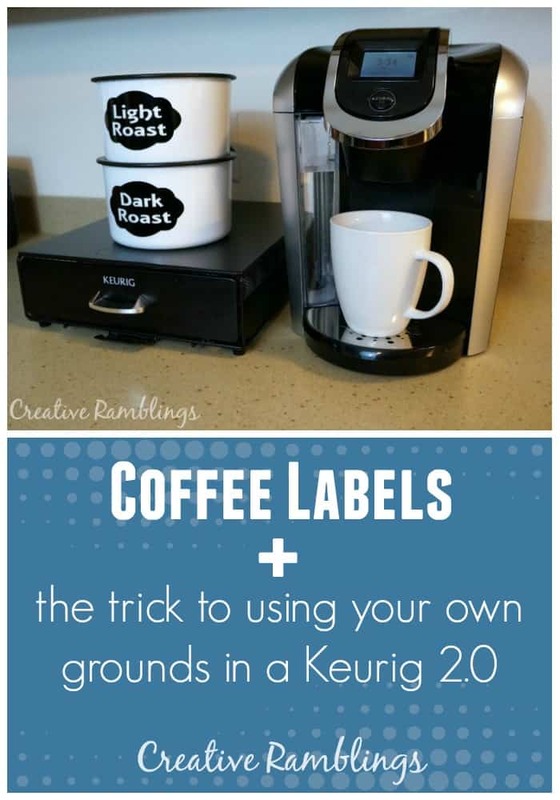 We have also found a way to use our own grounds in the Keurig (read on for our little trick) which we love. With all the variety, our coffee station was looking a little sad. 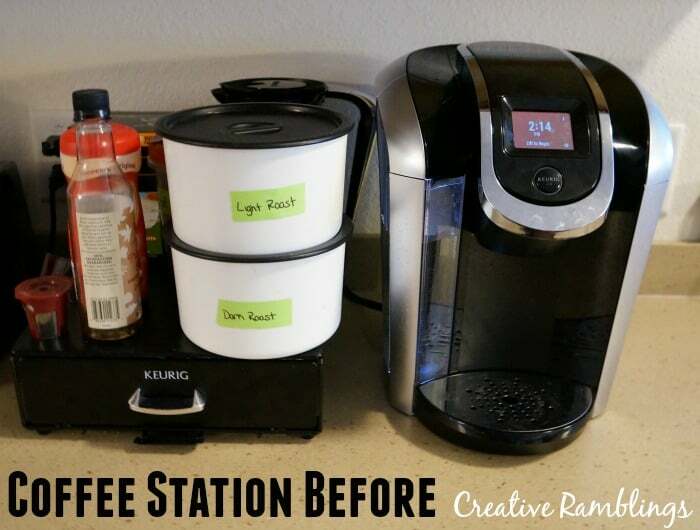 With some cabinet organizing and pretty coffee labels I spruced up the area in under an hour. This was our coffee station earlier this week. Looking sad. The cabinet above houses all the pods that do not fit in that nifty little drawer on the counter. However that cabinet was a disaster. I started by organizing the cabinet and making room for all the extras. I don’t need everything out on my counter, I usually end up knocking something over in the morning anyway. Next, I set to work making some simple labels using vinyl and my Silhouette. I used some basic shapes and a fun font to create and cut these. After weeding the vinyl I transferred them to the containers using contact paper (my favorite method of transferring everything and keeping it lined up). I gave my canisters a good cleaning then transferred the vinyl labels onto them. I love how they look but I think I like the fact that I found a home for everything else just by organizing a cabinet. My coffee station looks so neat and tidy now! I love the variety of coffee pods available for a Keurig, but I do not love the price. This was a gift and we do really enjoy it but, being the thrifty family that we are, $.40 for a cup of coffee versus $.40 for a pot of coffee can be a tough pill to swallow. For me it is worth the price to have an indulgent cup of coffee in the afternoon, typically when my kids are napping. You can now use Vue packs in a Keurig 2.0. This allows me to make a latte or cappucino at home at half the price of a coffee house. 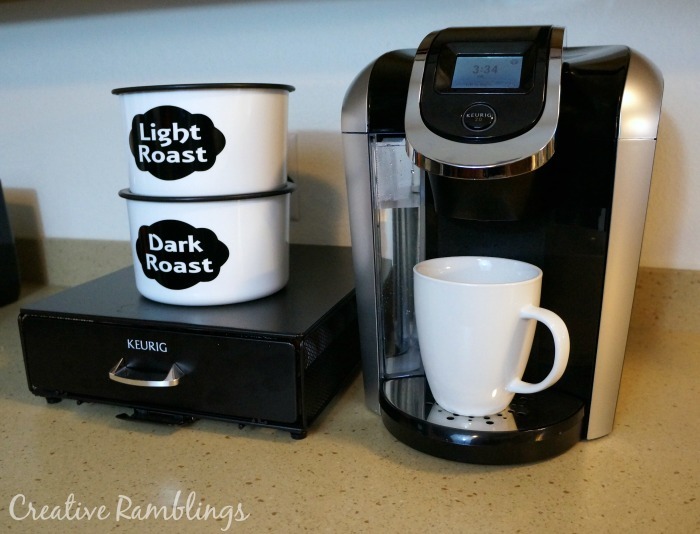 I did some research and found a way to use my own coffee grounds in this machine! There are a couple of ways you can do this, and I have tried most of them, but the way I will show you in this video works every time. I referred to the product below in the video, if you have a 2.0 this is a great accessory. Tell me about your coffee. Do you have it every day? What’s your favorite?